Earlier this year we went on a cruise from Barcelona. We’d booked our flights and cruise separately. Whenever we do this we always like to fly out the day before, just in case we encounter any issues. It’s also nice to explore whichever city we’re departing from. 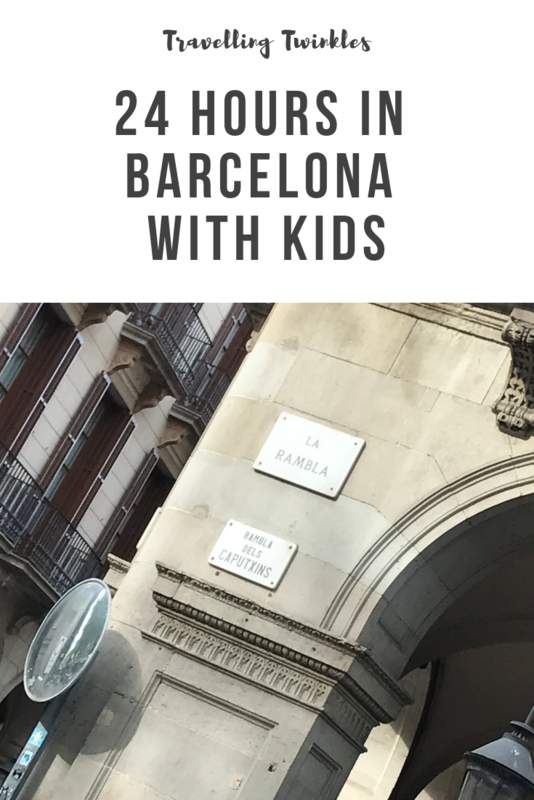 We had a great time exploring Barcelona, so I thought I’d share our suggestions for how to spend 24 hours in Barcelona with kids. 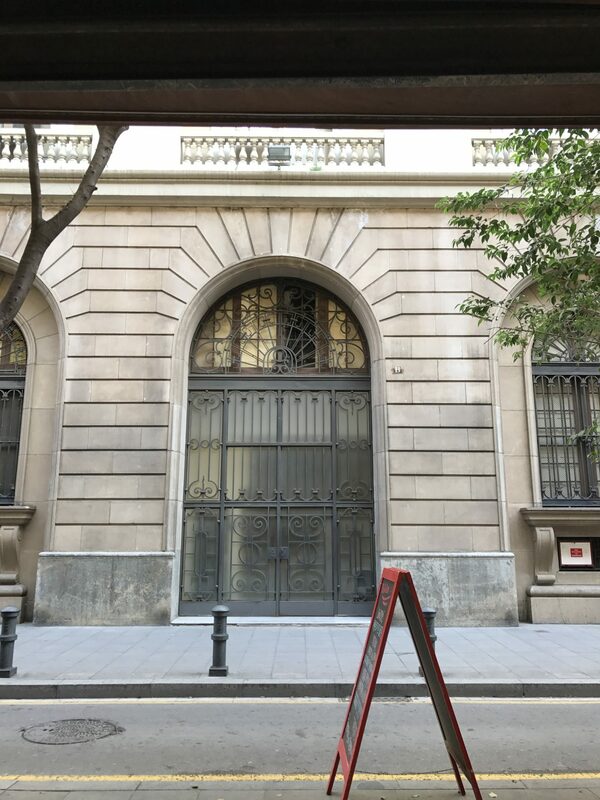 We arrived at Barcelona airport at around midday and took a short taxi ride to our hotel, Hotel Catalonia Port, which is literally a 5 minutes walk from La Rambla and is situated in the city’s gothic quarter. The hotel is quite a small boutique hotel, that’s perfectly situated to explore the city as well as being close to the seafront. At check in we were offered a welcome class of cava, which is always a good start! The rooms were lovely and modern and nice and spacious, which can sometimes be difficult to find when staying in a city. Id definitely recommend taking a look at this hotel if you are looking for somewhere to stay in Barcelona. Once we’d dropped off our bags in our rooms and freshened up a bit we decided to head out to explore. We didn’t have any particular plans, we just wanted to have a leisurely wander. 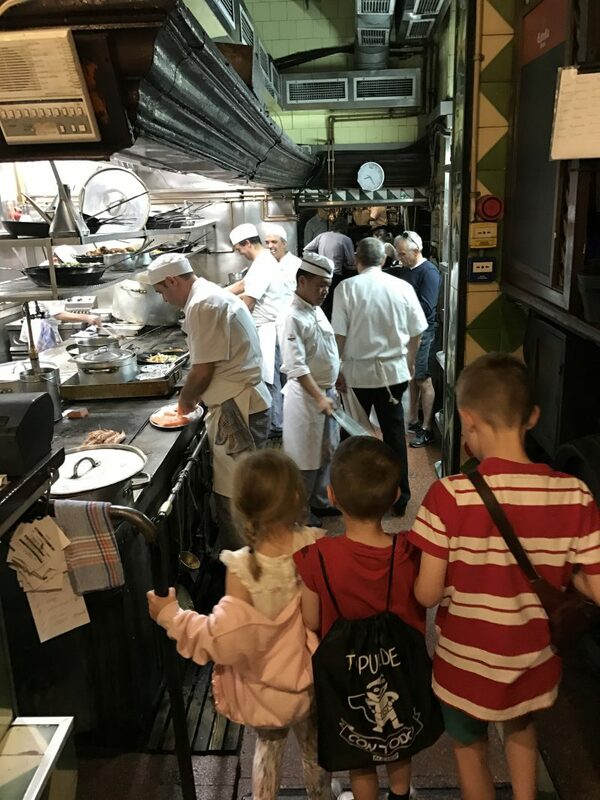 Our hotel was situated on a lovely little side street and right next door to the hotel was a fab little tapas bar that served the most amazing churros and hot chocolate for the kids. 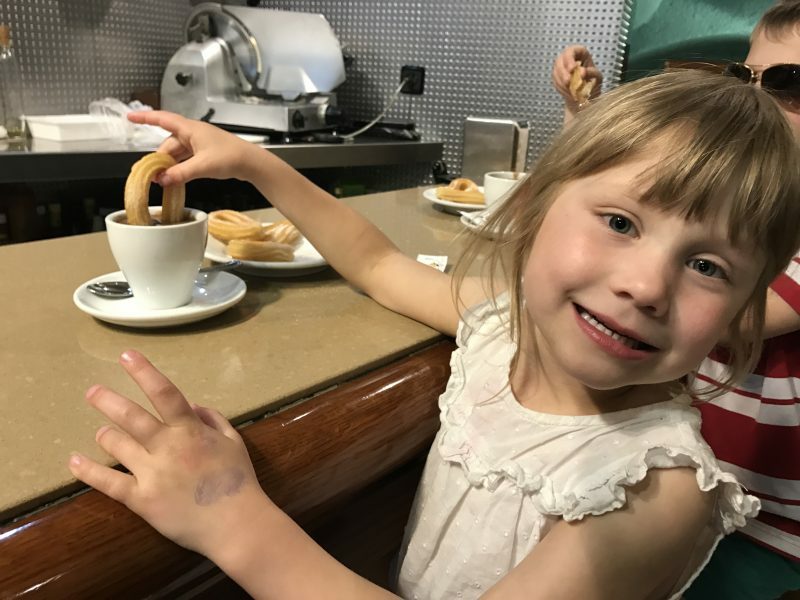 We sat at the counter and ordered a few bits of tapas and had a nice glass of wine whilst the children enjoyed their churros. The atmosphere was great. 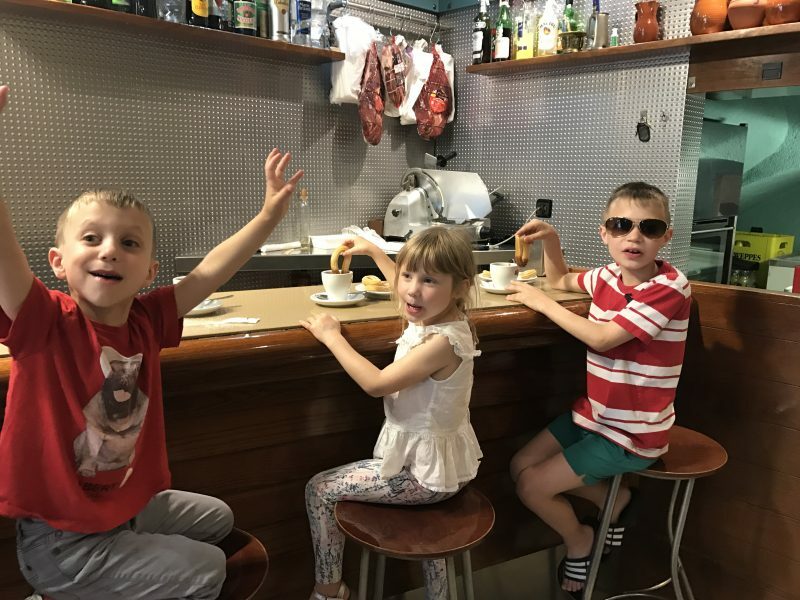 After we’d finished munching on tapas we headed towards Las Ramblas, although on the way we spotted another lovely little bar, so we popped in for another drink and more tapas! 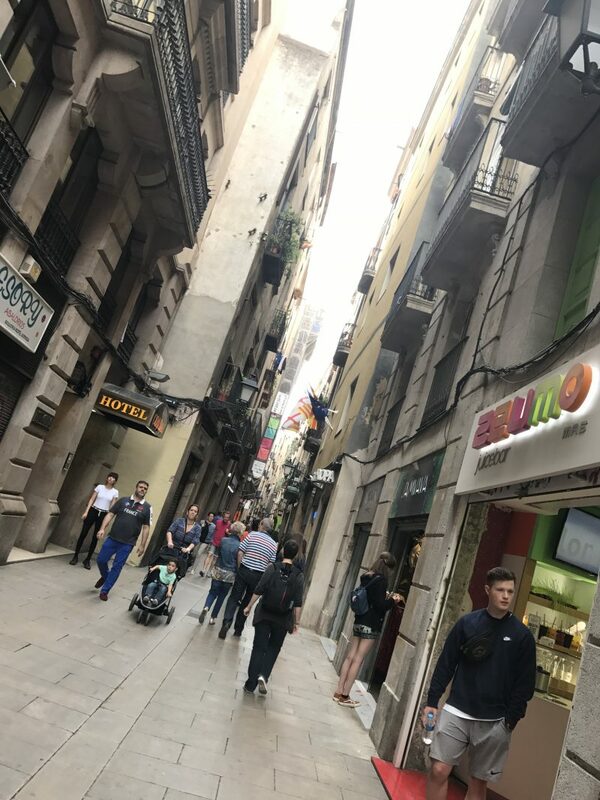 When we finally got to La Rambla we spent quite a bit of time wandering around the market stalls, popping into shops and wandering up the little streets that are just the main stretch. 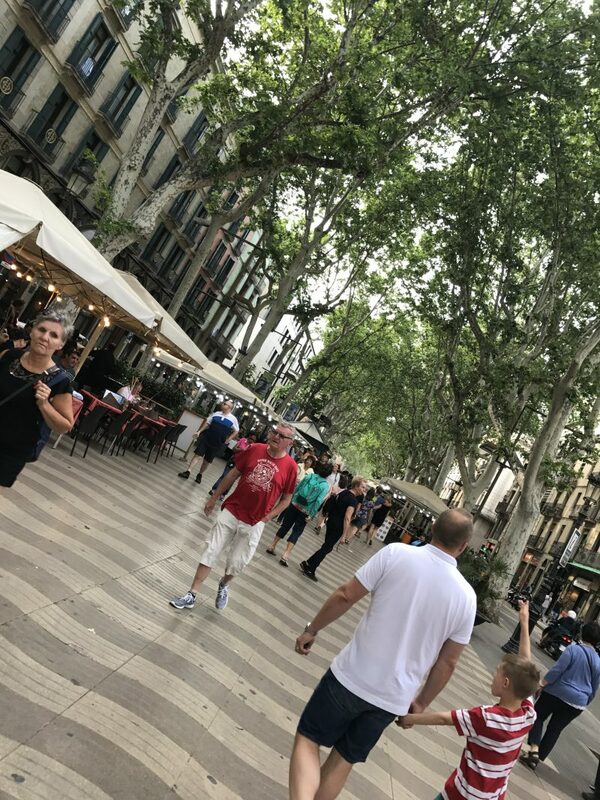 The atmosphere on La Rambla is really great. 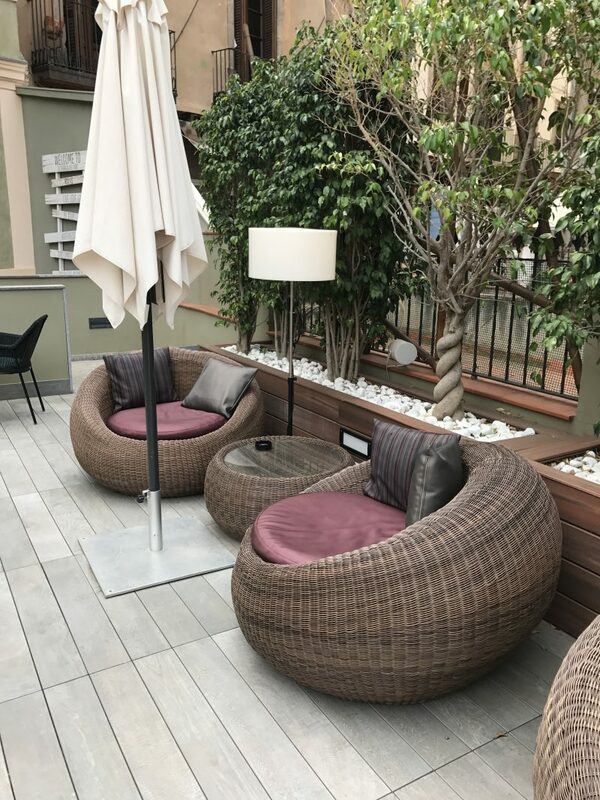 There are also lots of bars and restaurants where you can sit outside and take in the atmosphere. More we’d set off on our trip, we’d spent a bit of time researching where to eat for our evening meal. We wanted to plan ahead so that we didn’t up walking around trying to find somewhere that could fit us in. 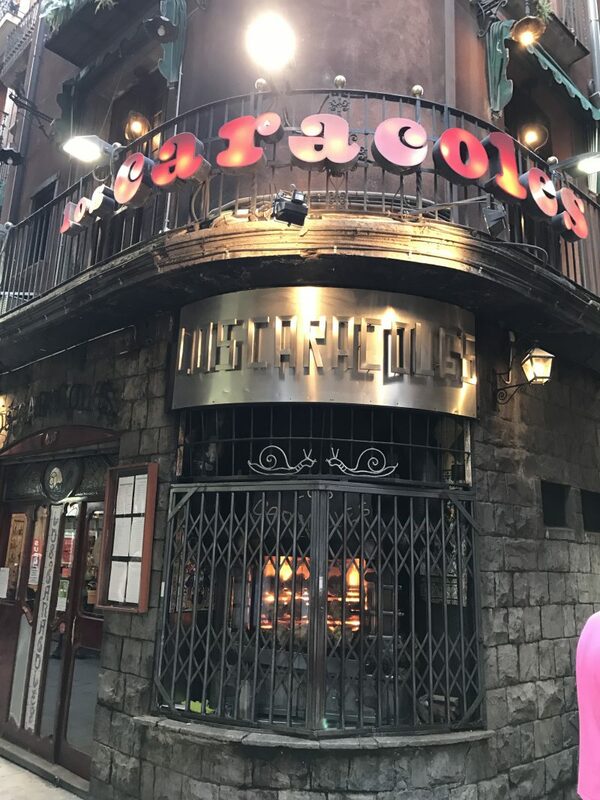 In our search we came across Los Caracoles, which is a traditional restaurant that was established in 1835. The atmosphere is pretty chaotic and you have to walk through the kitchen to get to the tables at the back, which is where we were seated. However, that just added to the rustic charm and the kids thought it was great! There is a good selection of catalonian dishes, including paella. I had the cod paella, which was ok, although other dishes did look better and everyone else seemed to enjoy theirs. Although the food wasn’t the best I’ve ever had, I’d still recommend dining at Los Caracoles for the whole experience. After dinner we were all pretty tired as we’d had an early flight, so we decided to head to bed. Simon and Oscar wanted to watch a football game that was on, so they went back to the bar next to the hotel to watch it. Apparently everyone was so friendly in there and they ended up have a great evening with some locals. 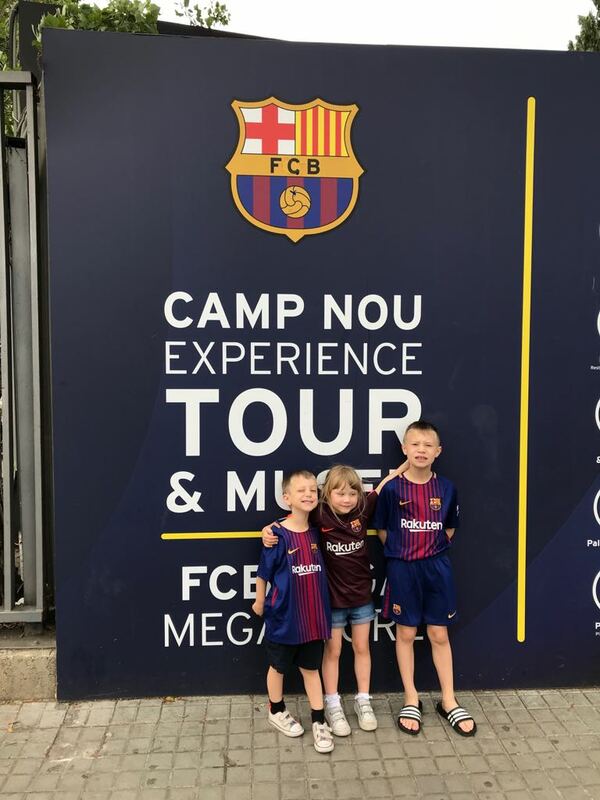 The next day Simon and my dad had booked to take the kids to Nou Camp, home of Barcelona Football Club, for a few hours. They took the metro, which was pretty close to our hotel and they all had a great time. The pics are fab. My mum and I took the opportunity to have a lazy morning. 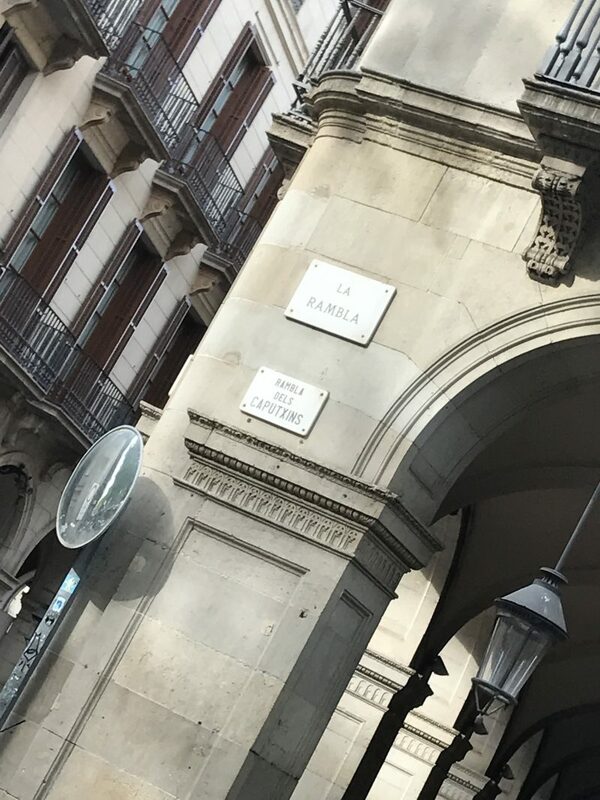 We headed to Las Ramblas to get a spot of breakfast and do a bit of clothes shopping. We headed to H&M and Zara and were a bit disappointed to find that they were closed as it was a Sunday. We decided to have a coffee and then wander back to the hotel to read by the pool. The Hotel Catalonia Port has a lovely little pool and outside area, which again, can be difficult to find in city hotels. By the time the other returned, we were definitely in full holiday mode as we headed to the port to get on our cruise on Symphony of the Seas. 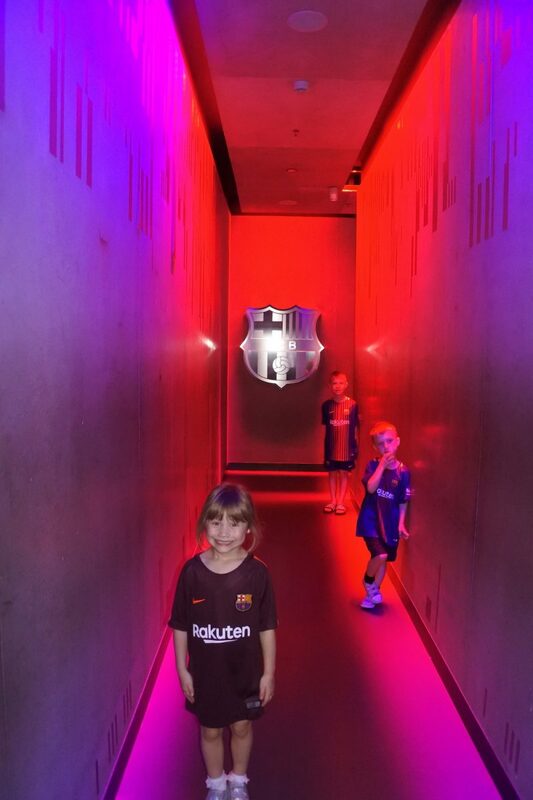 Jess who blogs at Mothers Who recently took her twins to Barcelona on a weekend city break. 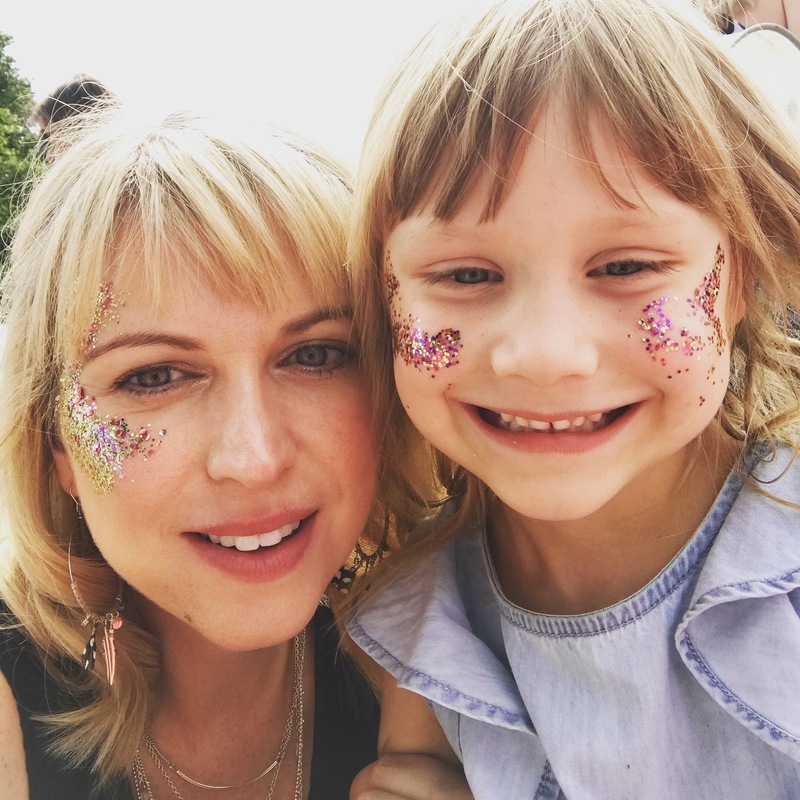 Here’s some tips she’s put together on travelling to a European city with small children. Barcelona is somewhere I would LOVE to visit – it’s supposed to be such a beautiful city. The hot chocolate and churros would definitely go down well with my girls! 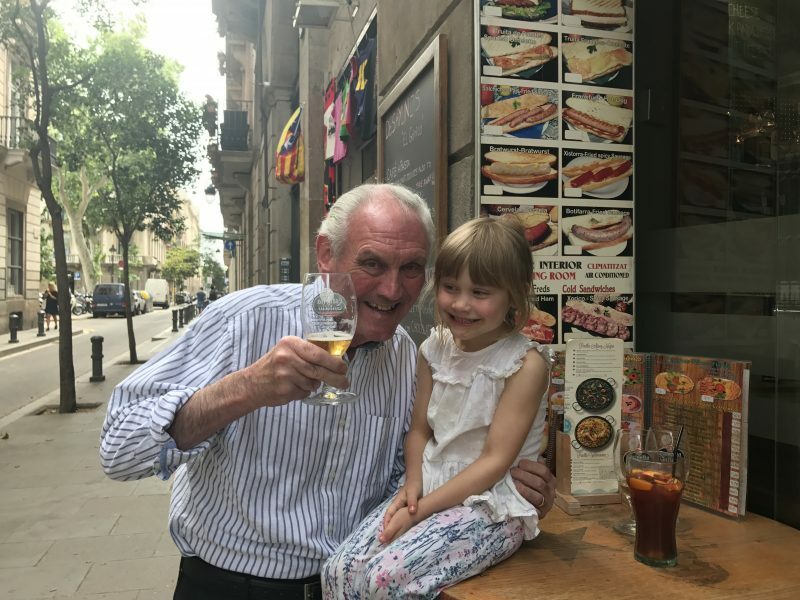 I love Barcelona and have been a few times either visiting or with friends but never with my little one. I have thought about it quite a few times though so might have to pop this one on the list. Nothing better than a Tapas crawl!!! 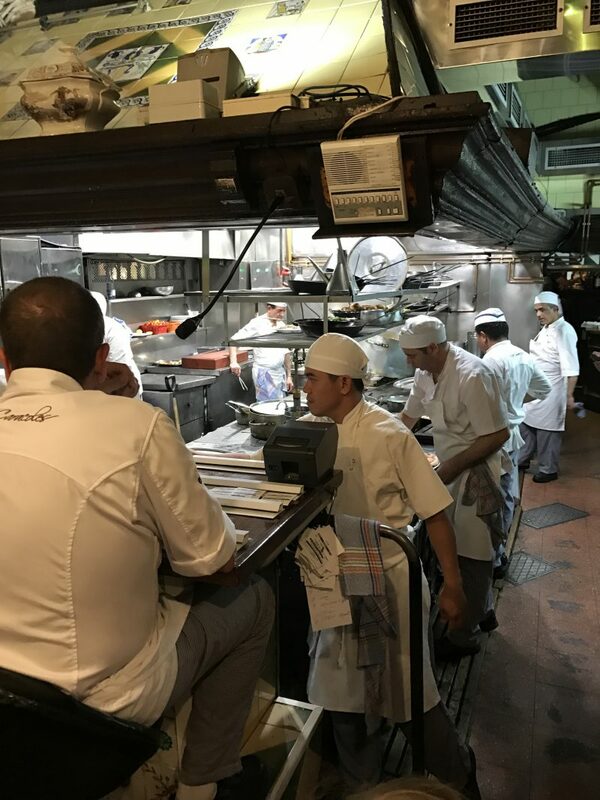 I love the idea of the restaurant that you have to walk through the kitchen – how funny! 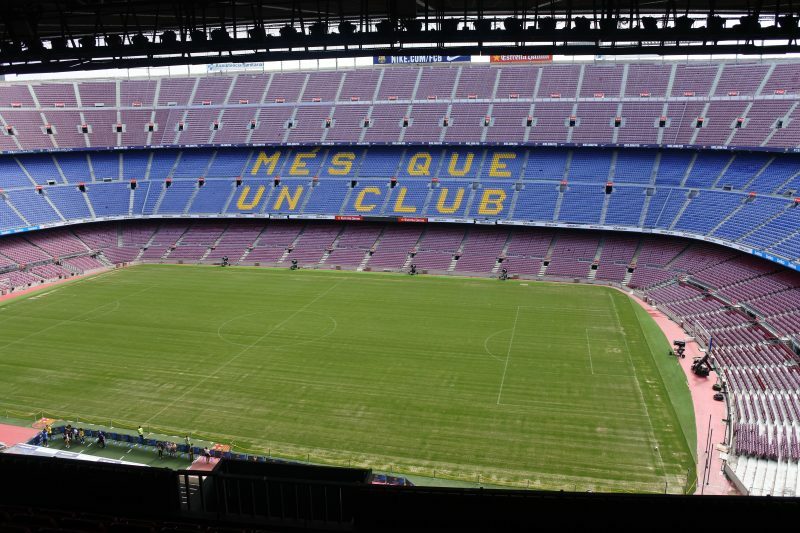 And my boys are DESPERATE to visit the Nou Camp. We’ll have to take them one day.